Many have compared Mr. Shifty to another top-down action game that goes by the name of Hotline Miami. Let me be blunt right off the bat: Mr. Shifty is no Hotline Miami. Where one excels in style through its psychedelic art, non-linear storytelling, ear-thumping music all tied together by fun gameplay, the other is a more simple and straightforward experience. Now, don’t get me wrong, Mr. Shifty is a fun game. Unfortunately the fun was also the aspect I questioned the most during my three hour playthrough of the indie title produced by the four man team based in Auckland, Australia, Team Shifty. 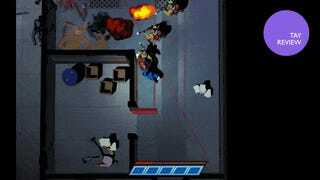 Let’s get down to basics, Mr. Shifty is a top-down brawler where the titular character has one special ability: he can teleport (or shift as the game prefers to call it) over short distances, like Nightcrawler from the X-Men. If you didn’t know already, teleporting is pretty cool, just ask anyone who has played Dishonored. You know what’s even better? Teleporting through walls and having a room full of fools trying to figure out whether you’re going to kick (punch) their butts or their chins. Or in some cases, fool them to shoot each other. Just like Super Mario Bros. is all about the jumps, Mr Shifty’s gameplay boils down to his, ermmm... shift ability. Whether it’s a single shift that gives you advantage over your enemies, or using multiple shifts (up to five) to get away from a sticky situation. It’s a simple concept that carries all the weight of the game from start to finish. Levels are broken down to different floors inside a tower conformed of a series of rooms that range from claustrophobic hallways that force you to think on ways to move around the enemies to large battle arenas, and even rooms full of traps. Some levels introduce new enemies while others introduce new gimmicks that twist the gameplay in different ways. Question: What makes a Mario game click? Answer: Simple level design that revolve around Mario’s abilities, which is most often than not, his jump. For a more detailed explanation of that topic, I recommend watching Mark Brown’s video on the Four Step Level Design philosophy Nintendo has implemented to keep their flagship franchise relevant. One of the few instances where the game perfectly introduces a new gimmick. Team Shifty, more or less, implemented this philosophy into their game, with the best examples showcased when it takes advantage of the central mechanic, like when it introduces the use of weapons or when ironically Mr. Shifty can no longer shift. The problem arises when the game relies too much on the same gimmick. Unfortunately this case is usually the norm in Mr. Shifty and by the time the game hits the halfway mark, the quality of the game dips due to fatigue. The game constantly gets stuck in a cycle of great set pieces marred by large sequences of filler content. Here’s the deal: when playing games, I usually categorize them depending on what the game makes me feel while I play them. Games like Super Mario 3D World give me thrills and fun through the inventive platforming, while there are also games like the latest Assassin’s Creed where I just simply complete the tasks because the game commands says so. In short I’m following orders. Mr. Shifty lingers more towards the latter with hints of excitement of the former. Every now and then you’re hit with extremely clever level design only for the game to ditch the idea and force you to battle room after room full of enemies. It’s a constant journey of peaks and drops that ultimately affects the enjoyment of the game and personally, I believe it’s the reason why the single player campaign only lasts three hours. Aesthetically, Mr. Shifty looks clean and uses polygonal models for every asset of the game. Unfortunately it also gives the game a generic look. Talking about generic, the game’s story is comprised of cookie-cutter with a extra dose of cheesy dialogue. It’s specially bad when it tries to be funny and fails to do so. On the other hand, the soundtrack for the game is dynamic and helps set the mood to the action, with the caveat that there are only a couple of songs available. There is only a single-player campaign. There are no online leaderboards or any incentive to go back to replay the levels. In a AMA on Reddit, Team Shifty expressed that they are looking forward to add new content to the game in the near future, amongst them leaderboards and new levels. The Switch version of the game is riddled with technical difficulties, from glitchy graphics, enemies that clip through the environment, and worst of all, constant drops in framerate, to the point that it affects the gameplay when the game makes a full stop to process what’s going on in the screen. The publisher of the game, Tiny Build, mentioned in the same AMA session, that they’re working on a patch to fix the issues found on the Switch port. Mr. Shifty feels like buying fresh bread. The first day is amazing and you’re thinking about all the amazing things you can do with it and how it will change your life forever... then it gets stale and you question your poor life choices. Now, I may have complained a lot during the review and the general tone from may suggest to stay away from this game but... if what you’re looking for is a quick distraction and don’t mind the repetitive gameplay then go for it. When Mr. Shifty is good, it is really good and at times amazing. It’s a bit barebones but there is a good concept that if given more time will become a great game that everyone should play. All Images via screencap. GIFs courtesy of the publisher Tiny Build.